Warrior 1 is also known as Virabhadrasana 1. 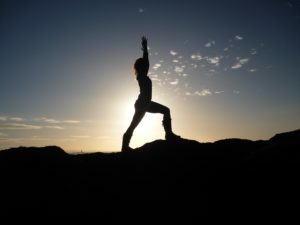 It’s a lovely pose that will help you steady and focus – so perfect for starting the New Year well! I did this Warrior 1 on a rock in Elie with the low sun streaming over the water – how lucky are we to live in beautiful Scotland! Back to yoga…This is pose ideal if you are outside or can see outside. Feet need to be steady on the ground, even if the earth is uneven make sure that you feel well grounded. This is of course important for every yoga pose – but when you want to see the bigger picture and make plans you need to be set up well. First ease you way into the pose, allowing hands to come up. This may be overhead or slightly in front of you. Breath your way into the pose, feel your breathing, feel the effect on how this moment feels. raise and lower your hands to get settled in a good way for you. Maybe you will want to reposition your feet. Once you feel ready allow your hands to come up and use your out breath to see far into the distance. As you breath in feel energy gently peculating up from the ground. As you breath out look steadily at the distance. You may find thoughts arising, try to let them come and go. This pose works on an energetic level rather than a logical problem solving one. Allow the your experience to be whatever it is. Do this until you no longer want to. Its that simple, now go on to what you want to do next. Maybe you will recall your steady overview, maybe things will flow more easily for you… maybe you’ll want to do it again. Enjoy it!